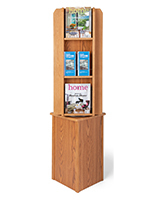 Tons of floorstanding, countertop & wall mounted models! 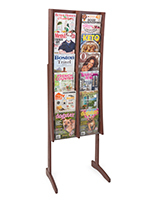 Stay neat & organized with these displays. 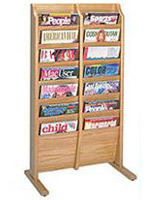 Great for waiting rooms, trade shows & other events. Showcase your book collection in style! Have a range of literature sizes? We have the solution! 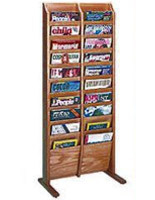 Great newspaper & periodical displays. A collection of our most popular items. Constructed of Solid Wood to Last Years! Ten Pockets on Two Sides Hold Tons! Light Oak for Myriad Decorative Environments! 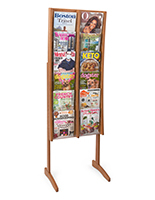 This 20 pocket paper sorter is super-wide, with 20 pockets in which to exhibit promotional materials associated with your business! With solid wood construction, this unit requires minimal assembly - if you have a simple screw driver to attach the feet for stabilization, you’re go to go! 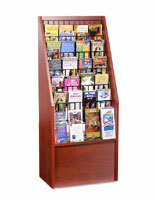 This 20 pocket paper sorter, also known as a leaflet holder, is your go-to for commercial displays! 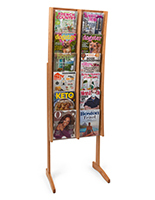 Showcase all at once a plethora of literature for customers in the waiting area or lobby of a hotel, office, or hospital using this freestanding racks system. 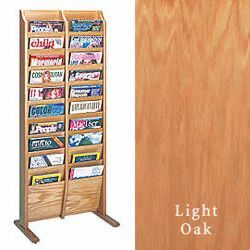 Each of these 20 pocket paper sorters that are magazine holders is finished in beautiful light oak so materials get noticed! 20.5" x 49.0" x 4.8"